B was looking through Robert Hess’s The Essential Bartender’s Guide the other night for something new when she ran across a rather oddly named cocktail, the Diabolo. No, not Diablo, Diabolo. Apparently it’s named after the Yo-yo shaped juggling device. I did a little digging around and kept running into Mr. Hess’s work. First thing I found was his recipe on his original site, Drinkboy.com. 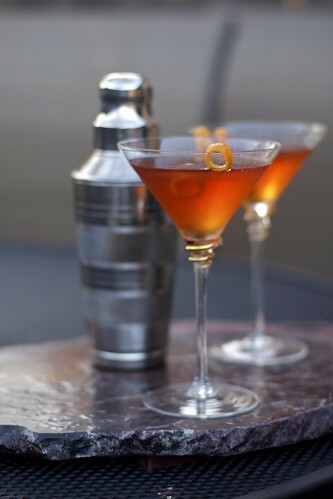 He mentions that the first reference to this cocktail is in the 1930’s in Harry Craddock’s The Savoy Cocktail Book. The only problem is this drink is a very different cocktail than the one in his book, containing equal parts of brandy and dry vermouth and large amounts of two different bitters. The next thing I found was a 4 minute video of him making the Diabolo that we made in his video blog, The Cocktail Spirit. So I have no idea what the history of this version of the cocktail is, but it was a thoroughly enjoyable cocktail, especially on a warm afternoon in February on our patio. Stir with ice and strain into a cocktail glass. Garnish with a twist of orange. Curiously, in his video, Robert Hess uses Cruzan’s light rum, whereas we used Cruzan’s aged rum (we watched the video after having had the drink). We haven’t had a chance to try it with the light rum, but the dark rum was very good. B and I both thought the Diabolo, both interesting and enjoyable. I definitely see it finding a place in our regular cocktail rotation. If you happen to know the back story on this particular version of the Diabolo, definitely let us know.